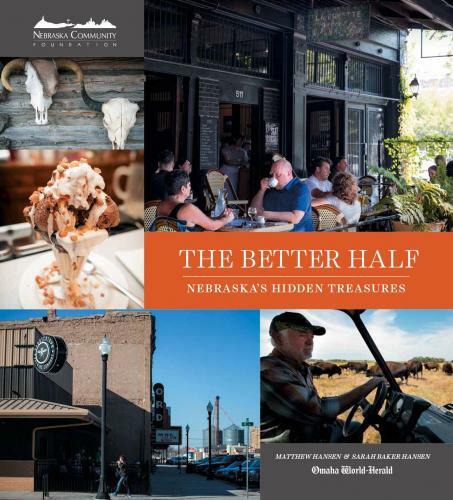 Omaha World-Herald food critic Sarah Baker Hansen and husband Matthew, World-Herald columnist, explored Nebraska from border to border, and each has learned to love the part of the state they didn’t know: The Better Half. Come along on their travels as they share with each other little-known people, unexpected moments and memorable foods across Nebraska. At each stop, they discovered more of what the state has to offer. Join them as they explore unique destinations from the High Plains Homestead near Crawford to businesses on Omaha’s up and coming South 24th Street. In between, Sarah and Matthew find the Norden Dance Hall, Dave Huthinson’s buffalo ranch in Rock County, Scratchtown Brewery in Ord and the Speakeasy restaurant in Sacramento. The book is packed with dozens of places in Nebraska to surprise and please the most demanding explorer. Omaha World-Herald food critic Sarah Baker Hansen grew up in suburban Omaha. Her Husband Matthew, World-Herald columnist, came from Red Cloud, population 1,000. This beautiful book will give you worthy destinations for every road trip you take in Nebraska. Next time you’re traveling one of our many long highways consult this book first and plan some breaks. Your life will be enriched with quality food, brews and other surprising products. --Duane Gudgel, The Plains Trading Company Booksellers.